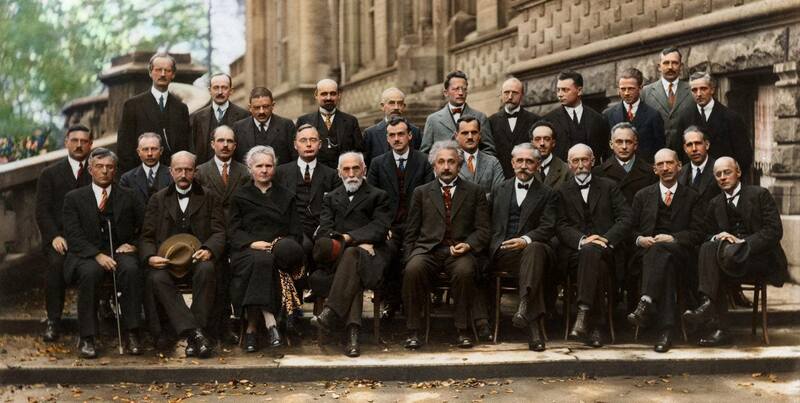 Einstein’s theory of relativity and quantum physics completely shattered all previous scientific paradigms. I have found David Bohm’s explanation of Einstein’s Special Theory of Relativity fascinating, since he is able to take us through in an extremely clear manner the very changes in conceptual thinking that Einstein went through. Whereas previously science had attempted to study the absolute underlying substance of the universe, sometimes appealing to the concept of an ether, through which for example light was said to require, Einstein suggested that what was in fact fundamental was the relationships between various aspects of the universe. Einstein forced science to go through a complete rethink about both our common everyday understanding and the prevailing scientific notions of absolute time and space. Were sub-atomic particles now to be explained as waves or particles? How can we achieve an objective theory of the universe, when the observer of an experiment appears to affect the outcome of the experiment? The main thrust of the Copenhagen Interpretation, which is the interpretation of quantum theory accepted by the bulk of the scientific community, is that the proper goal of science is to provide a mathematical framework for organising and expanding our experiences, rather than providing a picture of some reality that could lie behind these experiences. That is, most physicists today side with Bohr, rather than with Einstein, on the question of the utility of seeking a model of reality that can be conceived of as independent of our experience of it. While physics in particular has now become more holistic in its thinking, psychology, and in particularly cognitive psychology, has sought like biology before it, to acquire the cache of physics, and with the computer being the most complex machine in use today, it is not surprising that the computer remains the dominant metaphor, both in psychology and in biology in relation to models of information encoding in DNA. 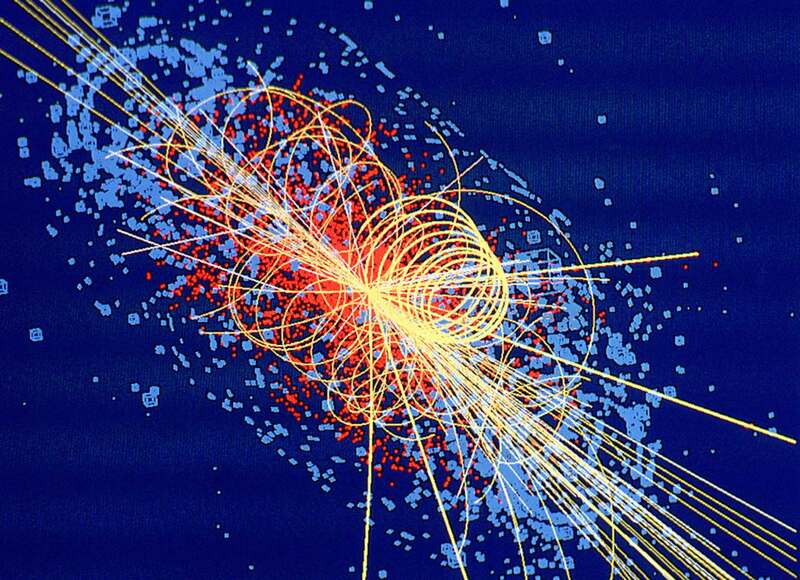 Reductionism in physics continues to capture the public’s imagination, and enormous budgets as well, in the search for the most fundamental building blocks of matter, the Higgs boson. In approaching the topic of quantum physics, I am extremely consciousness of the quote by Richard Feynman who said that “I think I can safely say that nobody understands quantum mechanics.” Feynman also said that paradox is only a conflict between reality and your feeling of what reality “ought to be”. I do feel that we can gain a huge amount of insight about the processes of dialogue and creativity in business, by examining the thinking processes of quantum physics, especially via the process of encountering paradoxes, which is also found in Goethe’s way of seeing which we write about in our book Holonomics. It is important to realise that in physics today, we have no knowledge what energy is. We do not have a picture that energy comes in little blobs of a definite amount. More recently, Lee Smolin has really attempted to describe what he now sees as a crisis in physics, especially with the development of string theory which sees the universe as being made of infinitesimally small, vibrating filaments of energy moving through multiple dimensions. Brian Greene has written that string theory is based on a new form of mathematics which is so complicated, even those who are creating the mathematics do not fully understand. From this comes a theory which remains untested, because according to Smolin “they make no clean predictions or because the predictions they do make are not testable with current technology”. So the crisis at the heart of physics is not being able to accurately describe reality. Our mechanistic view of the universe, perhaps thinking of matter as consisting of tiny snooker balls bouncing off each other is good enough to get by in life, and a particle view of physics is good enough to create the technology that so dominates modern life, even though those who are designing it are not yet able to understand the meaning of their science. It is not so much the formal aspect of science therefore that can generate so much disagreement, but the interpretation. This can be seen in the many conversations and arguments between Einstein and Bohr, who in the 1930s were unable to speak to each other even when in the same room. The difference was in their informal language in how they were conceptualising reality. Bohr interpreted the fundamental concepts of physics ambiguously, but for Einstein they had to be unambiguous. Still to this day physicists have been unable to reconcile quantum mechanics with Einstein’s theory of relativity, despite the monumental efforts from the global scientific community. 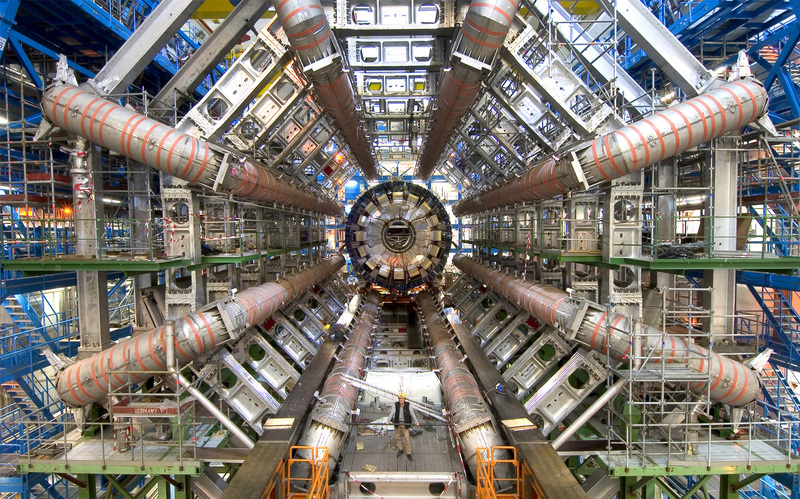 The Large Hadron Collider (LHC) is a gigantic scientific instrument near Geneva, where it spans the border between Switzerland and France about 100m underground. It is a particle accelerator used by physicists to study the smallest known particles – the fundamental building blocks of all things. It will revolutionise our understanding, from the minuscule world deep within atoms to the vastness of the Universe. Note the very explicit and mechanistic metaphor of “building block”. This metaphor suggests solidity and materialness to these particles which exist as separate entities. But then note how in the second paragraph it is explained that these experiments may well change the whole paradigm, and hence the metaphor. We have to be careful when dealing in metaphors and paradigms, not to get stuck in one way of thinking. Modern physics is not experimental physics because it uses experimental devices in its questioning of nature. Rather the reverse is true. Because physics, already as pure theory, requests nature to manifest itself in terms of predictable forces, it sets up the experiments precisely for the sole purpose of asking where and how nature follows the scheme preconceived by science. A great influence in my life has been quantum physicist David Bohm (1917-1992). To me Bohm is a remarkable thinker, and has written many works not only on quantum physics, but Einstein’s theory of special relativity. More than just a physicist, Bohm in his writing was explicit in elucidating the movement of thinking behind the physics, and as such he also wrote about creativity, dialogue, and how a new mode of thinking was required to be able to perceive and then solve the many problems contributing to the global crisis we face today. The more views we can get, the deeper our understanding of the reality there is. The essence, or what I call the true being, we can never get hold of. Every view is limited, it’s like a mirror looking this way, or that way. Theories do not give final true knowledge, they give a way of looking at something. The very word “theoria” in Greek means “theatre” so it is the theatre of the mind which gives insight into the thing. Science is primarily a perceptual enterprise, and not in gaining knowledge, though knowledge appears. Knowledge is a by-product. By understanding something, you can have contact with it, so long as it is coherent. It shows that our perception is correct. So we must distinguish between correct appearances and incorrect or illusory appearances. Our thinking process should be called an extension of our perceptual process when done rightly, and not primarily the accumulation of knowledge. Henri Bortoft studied under Bohm at Birkbeck College in the 1950s. It was Henri who suggested to me that quite possibly the best book about Bohm was written by another colleague of Bohm’s, the Finnish philosopher Paavo Pylkkänen. Through studying Bohm through Pylkkänen, and with much personal help from my tutor at Schumacher Philip Franses, I really came to appreciate his conceptualisation of reality as an unbroken wholeness. If truth be told, I must have spent an entire year studying Bohm and it is through Bohm that I was then able to go back to Henri’s work a year after leaving Schumacher and really begin to work hard in comprehending Henri not just intellectually, but experientially as well. So although this book begins with Henri’s work, the reality was reversed, and for me Bohm came first. Before discussing David Bohm’s reconceptualisation of quantum theory, a great deal of value can be gained by his explanation of Einstein’s Special Theory of Relativity. Bohm had many conversations with Einstein during his time at Princeton, and in his classic text on the subject from 1965, we can learn a huge amount, not in terms of the physics, the maths of which is far beyond me, but in terms of understanding further how our mental models of the world come into being. Many people will have some knowledge of Einstein. They will know the famous equation E=mc2 and their knowledge about relativity may involve thinking about trains travelling at velocities close to the speed of light while observers flash torches. But it seems to me that the deeper implications of Einstein have by no means changed our still Newtonian mental models of solidity, invariance, and the notion of three dimensional space and time. Bohm is really able to bring out these implications eloquently and I will now try to summarise the lessons I have taken from reading his work. In many books written about complexity theory, and this book is no different, there is a call for people in business to stop thinking mechanistically. But it took a genius like Einstein to be able to conceive, in his intuition, as well as mathematically, of a radically new relativistic universe. In normal life, when we give something a name, we come to think of that thing as having permanent characteristics. In physics, we give the name “mass” to certain properties observed in common experience. In common language, mass refers to “quantity of the permanent substance of matter”. Physics defines mass in relation to two refined definitions, inertia (or resistance to acceleration) and gravitation. We may struggle to understand relativity because as Bohm says “we are very likely also unconsciously to replace the precise physical meanings of gravitational and inertial masses by the common notion of mass as “quantity of the permanent substance of matter”. We learn from Einstein that mass is in fact just a relative invariant, in the sense that its changes can be neglected only in the Newtonian domain. Einstein therefore was able to intuit an entirely new concept for mass and energy in a way no person had ever achieved before. He also took away from science the notion of absolute space and time. In Ancient Greece, and in our common-sense view of space, “space is regarded as a kind of receptacle, inside which each thing has a certain place, size and form. Thus space is in effect “substantialised” and taken as an absolute.’ This notion of space “has been built up and learned in the early years of each person’s life. Since then the use of this concept has become a habit, further reinforced by the structure of the common language, in such a way that it is very difficult even to think or to say something that is intended to deny or contradict it. I feel that there is an extremely important lesson in terms of relating this shift to a relativistic world view to our previous discussions about tools, frameworks, and paradigms. What may get lost in calls for us in business to move to a new paradigm is that we are not just being asked to utilise a new framework, once which can be communicated to us in a workshop, or on a course. What we now have to contemplate in business is going through the often traumatic process that the physical sciences have had to go through, in entirely shifting our world view, to the extent that very fundamental and common-sense notions have to be rejected, allowing us to start afresh in our thinking. This is what Einstein achieved. My main concern has been with understanding the nature of reality in general and of consciousness in particular as a coherent whole, which is never static or complete, but which is an unending process of movement and unfoldment. Bohm proposed that particles have both a wave aspect and a particle aspect at one and the same time, as opposed to the wave aspect collapsing into its particle aspect at the point of observation which others had proposed. Bohm used the analogy of a ship being guided by radar, in that the wave (or field) aspect of quantum system, such as an electron, influenced the particle aspect. Bohm saw matter being enfolded and unfolded in a higher dimension of reality which he termed the implicate order. What we have here is a kind of universal process of constant creation and annihilation, determined through the super-quantum potential, so as to give rise to a world of form and structure, in which all manifest features are only relatively constant, recurrent and stable aspects of this whole. 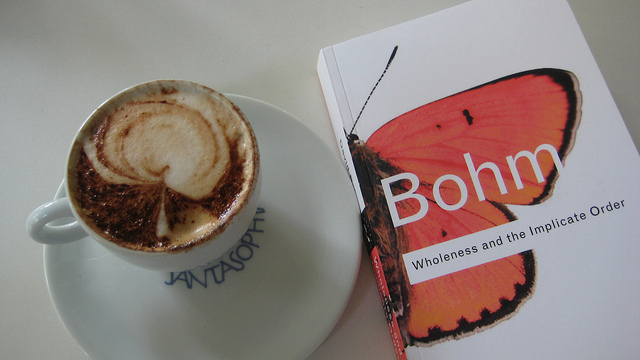 In Bohm’s work we see many new words for wholeness, in his attempt to explain his new conceptualisation, such as implicate order, quantum potential field, and holomovement. While we do not necessarily have to understand exactly what he meant by these terms, Bohm was attempting to make a radical shift away from our thinking about reality in terms of things. Bohm also tried to imagine in a thought experiment a very new way of using language which emphasised verbs, rather than subjects and objects as separate entities as language does today. As the discussions continued, Bohm learned about the process-based worldview of the Blackfoot, Ojibwa and Micmaq. Everything was said to be in flux, and this constant change is reflected in their verb-based language. At last Bohm had found a people whose metaphysics strongly mirrored his own. 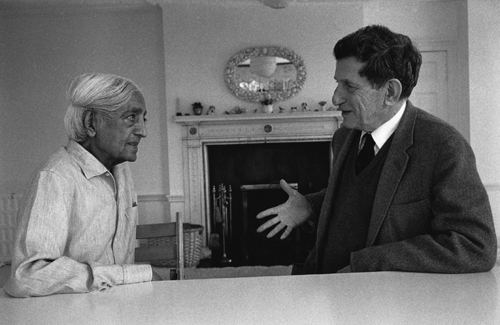 When the world becomes dematerialised, less solid, then there becomes space for entering into the mindset of great thinkers such as David Bohm, who was able to conceive of reality as a single whole, which while itself does not consist of separate objects, has at its very foundation dynamical flowing movement. This can certainly seem paradoxical, and it is perhaps the reason why deeply profound thinkers on complexity such as Philip Franses and Basil Hiley, a long-time colleague of Bohm talk about the study of complexity being more akin to alchemy and a pilgrimage.